ARS Inspections Real Estate Inspection Company provides New Concord Ohio home inspection and Cambridge Ohio home inspection services. As a Certified Master Home Inspector we are also licensed to provide termite inspection, mold inspection, mold testing and radon testing in New Concord Ohio and Cambridge Ohio. For a professional and affordable home inspector New Concord Ohio or home inspector Cambridge Ohio call as ARS Inspections Real Estate Inspection Company today. From a complete Cambridge Ohio home inspection or commercial building inspection to individual Zanesville OH inspection and services to FHA VA RD and USDA appraisal compliant inspections. 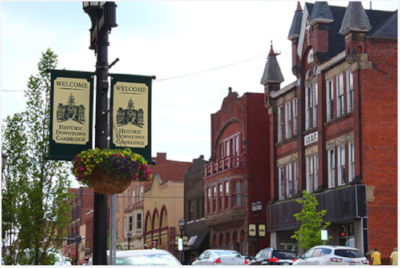 As a Cambridge Ohio home inspector and home inspection company with 30-years experience, we have inspected properties in Guernsey County of all type, style and design. We offer complete Cambridge OH home and building inspection services, Cambridge radon testing and Cambridge radon mitigation, Cambridge mold inspection, mold lab testing and mold removal, Cambridge termite inspection Cambridge termite and wood destroying insect treatment, gas line inspection and warranties. ARS Inspections provides professional and affordable Cambridge Ohio home inspection services. Since 1988, we have remained an industry leader in providing exceptional Cambridge home inspection and Guernsey County property inspection services including, termite, radon, mold inspections and gas-line warranties. Buying, selling, refinancing? Need a Cambridge Termite Inspection? We are able to provide your Cambridge termite inspection report for FHA VA USDA type loans. Did you know? We include a termite and wood destroying insect inspection at no additional cost with every home inspection. Need Cambridge Ohio termite treatment? Licensed through the Ohio Department of Agriculture as a termite inspector (13241) and a termite and pest control applicator (98081) We are able to provide your termite treatment with up to five year warranty. Buying an older Cambridge Ohio Home? It’s important you hire a Cambridge Ohio home inspector who understands these features and is able to answer your questions and concerns often associated with older homes. Having renovated dozens of older homes I am able to offer professional advice from hands-on experience combined with 30-years of inspecting buildings. Cambridge Termite and Wood Destroying Insect Inspection we include a termite and wood destroying insect inspection. What Our Past Inspection Customers Have Said..
Cambridge Buyer home inspection, Cambridge seller home inspection, Cambridge commercial building inspection and Cambridge investment property inspection, Cambridge termite and wood destroying insect inspection, Cambridgetermite damage inspection, Cambridge radon testing, Cambridge mold inspection, mold testing and sampling, gas line inspection and warranty, Cambridge FHA VA RD USDA loan compliant inspection. At ARS Inspections Real Estate Inspection Company our Certified Master Home Inspector has been providing property inspection reports since 1988. As a Cambridge Ohio home inspection and real estate property services company ARS Inspections has provided thousands of home inspection and property inspection services throughout Southeast Ohio. It is our experience that most home buyers like the house they are about to have inspected, while they are somewhat apprehensive due to the uncertainly of possible major issues with the house, otherwise it’s the perfect fit for them and their family. Our certified master home inspector has preformed thousands of Cambridge Ohio buyer home inspection reports on structures of all type, style and design his experience and hands on knowledge of the hundreds of factors and mechanical components that make up a home will provide you with the best home inspection available, one that will answer your questions, address your concerns and provides you with a clear and accurate overview of the house you are about to purchase. As an Ohio licensed Radon Mitigation Specialist we can provide radon testing and answer any questions or concerns you may have with radon as we also design and install Ohio radon mitigation systems.